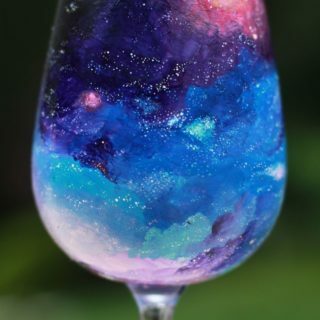 Ever since we were little kids, painting has always been one of our very favourite things to do when it comes to crafting and DIY. Whether we’re hand painting an image or just giving something we want to upcycle a nice, new coat of paint to spiff it up a little bit, painting is simply one of the crafty things that we enjoy doing the absolute most. That’s even more true, however, on the rare occasions that we get to paint something a little more unconventional! 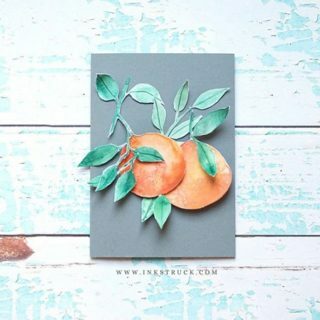 Sure, we’ve all painted walls and old chairs and classic décor things like that, but we’re talking about making hand painted art right on top of something other than just paper or canvas. What’s our favourite unconventional painting material, you ask? 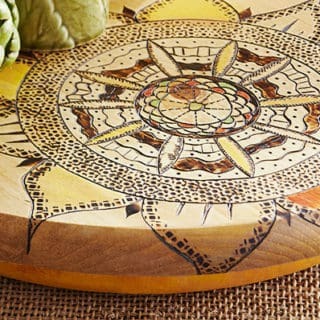 Well, we’d be hard pressed to pick just one, but we’ve certainly always been huge fans of painting on wood. 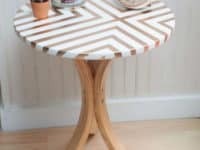 Check out these 15 awesome DIY wood painting project ideas that will have you churning out pretty decorative pieces like it’s your job! 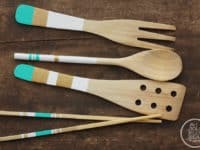 We might have gotten your attention with the mention of painting wood, but what if you’re actually an avid woodworker who’s used to doing a little bit more with the timber piece than just taking a paint brush to them? 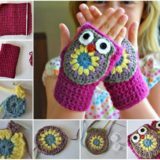 Well, then we’d say you’re even more prepared to make this first project suggestion than we thought! 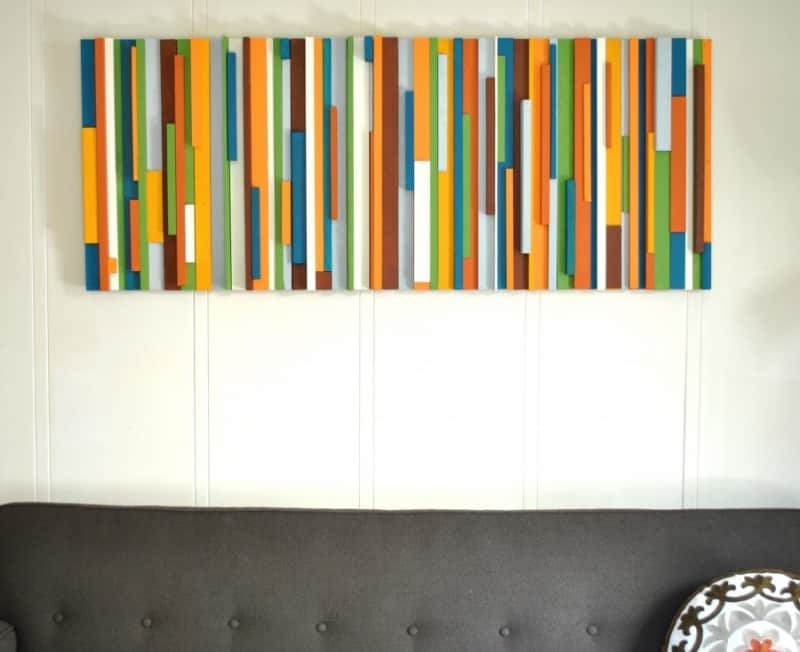 Check out this tutorial on Shelterness for creating a pieced together wooden wall art piece that lets you take full advantage of all the paints in your colour wheel once you’ve finished building it with your tools. 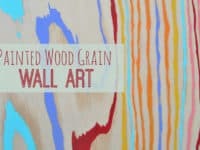 Are you just as obsessed with the idea of painted wood as we are but you’re honestly not that proficient with a saw or nails and you’d rather just paint a subtle detail on a premade wooden piece? 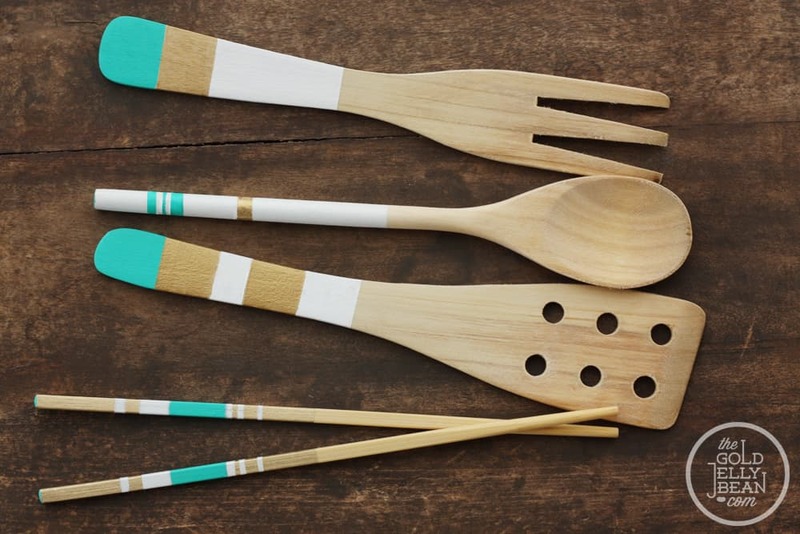 In that case, check out how The Gold Jellybean added just a small pop of colour to their kitchen by painting bright colour blocked stripes on their various kitchen utensils! 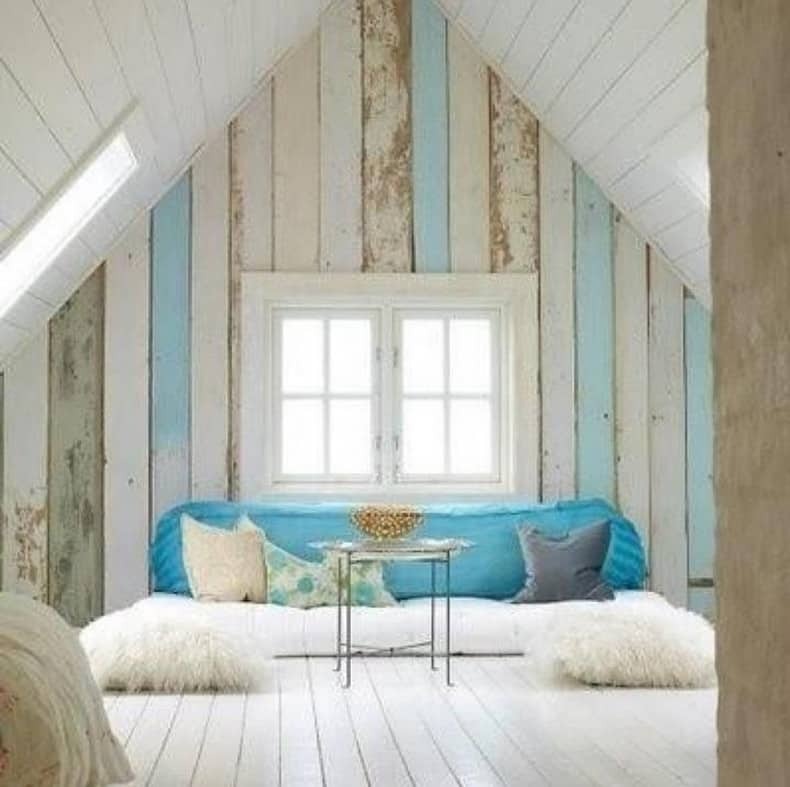 Are you much more into the idea of painting a scenic portrait than you are of just painting for the sake of adding colour, but you want something that’s going to look rustic and a bit stylishly unpolished so that it fits with the décor scheme in the rest of your house? 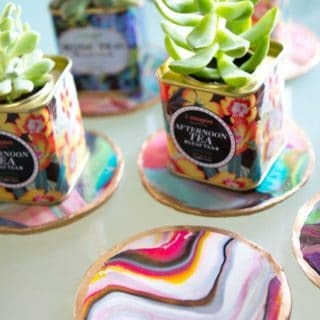 Then we think Completely Coastal might have just the idea for you! 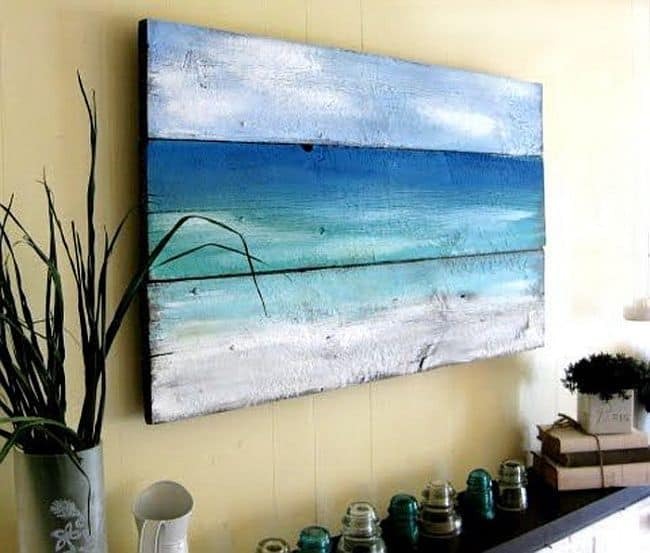 They guide you through the process of making a beautiful seaside scene on a wooden board of driftwood just by painting differently coloured stripes using a sponging technique. 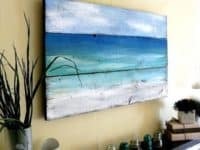 You’d be surprised how well the abstract blending of the colours actually resembles a beach scene even though you’re not painting much more than colour across the boards! 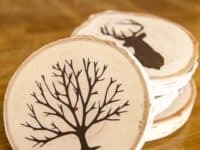 Are you feeling enthusiastic about the idea of adding shapes, patterns, and smaller details to your wooden piece but you’re just not that confident that you can neatly manage the pattern you want by hand? 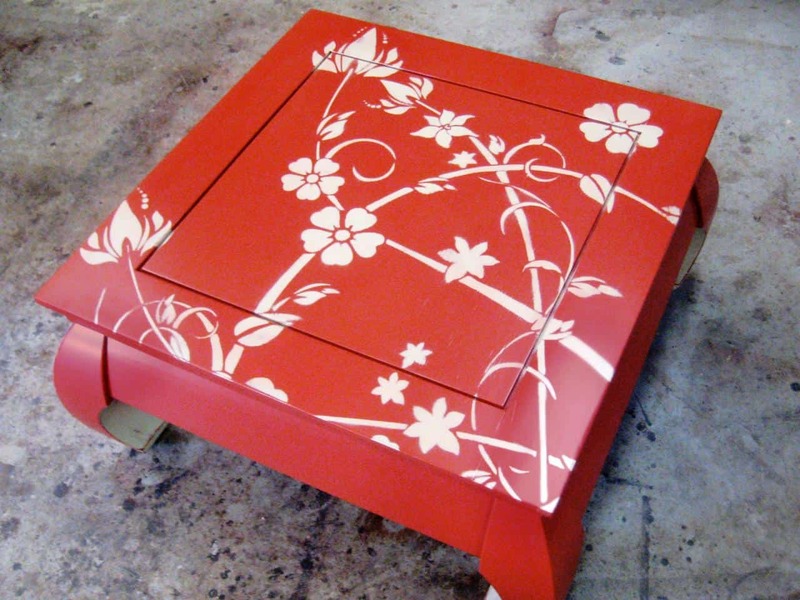 Then stenciling is definitely the best idea for you! 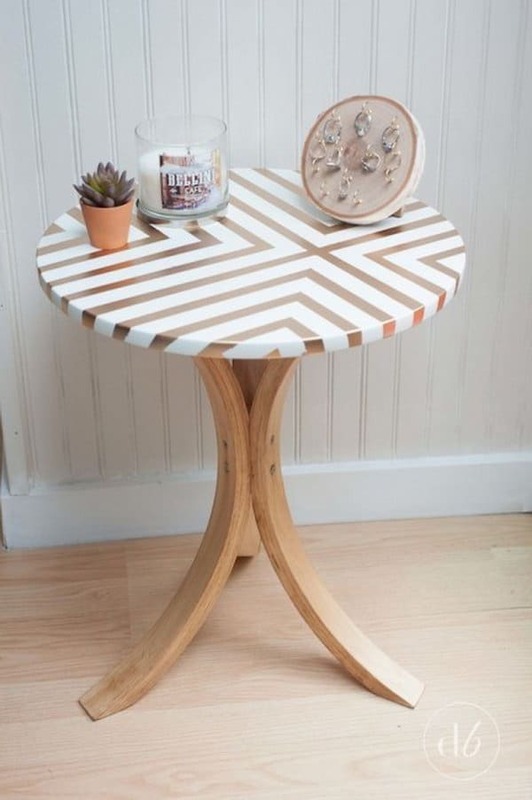 We love not only the stenciling tips and pattern that you’ll find in this tutorial from DIY Network, but also the mere idea of making yourself an adorable wooden end table that’s been entirely painted! 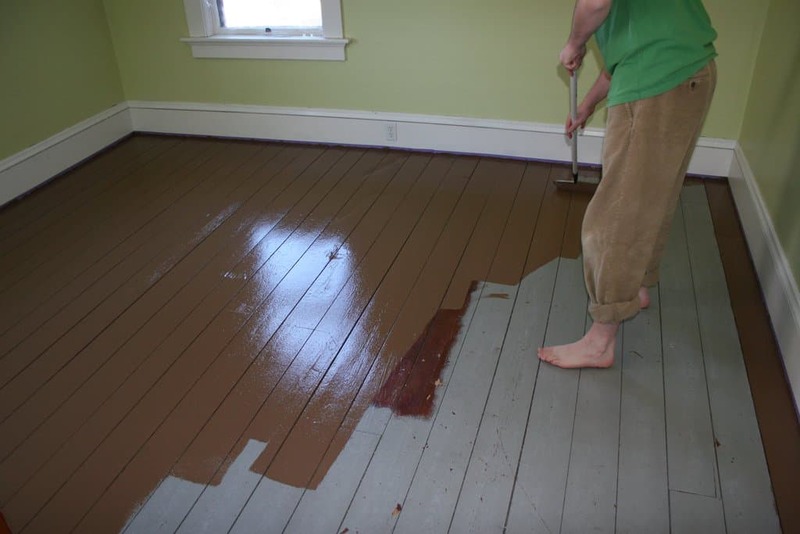 If you ask us, nothing’s off limits when it comes to painting wood, and that includes your old wooden floors! Of course, if your floors are brand new birch that’s just been perfectly polished and beautifully stained then you might not be interested in painting them, but we like this idea for older houses that need a bit of improvement and have a bit of a retro feel. This tutorial from The Fun Times Guide only really shows you how to apply basic coats of paint but imagine how creative you could get with a “canvas” as big as you’re floor if you’re feeling really bold with your décor and confident in your hand painting skills! 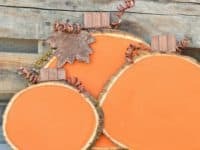 Perhaps the wood that you’ve gotten your hands on for painting purposes is a log section like you might find in homemade wares stores, carved into clocks or plaques? 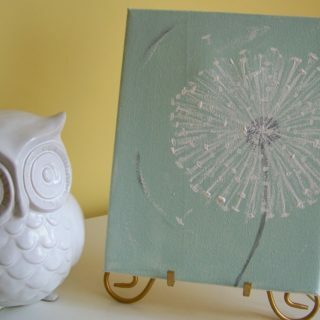 Then you’re in luck, because those make great unconventional canvases for painting! There are practically unlimited painted patterns, images, and designs that you can create on a cut wood section, but we’re particularly fond of these cute painted pumpkins from Inspiring Pretty. 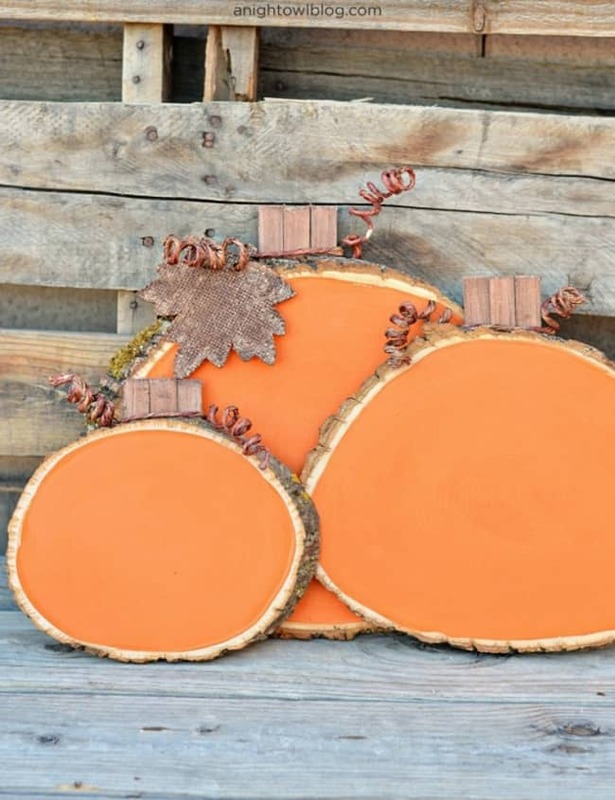 Are you still intrigued by the cut wood section plaque idea we just showed you above but you’d rather make something that’s got practical use for your family as well, rather than just being decorative, no matter how cute the pumpkins are? In that case, why not make a DIY note board that your family members can leave bits of information on for each other by the phone or as they leave the house at different times? 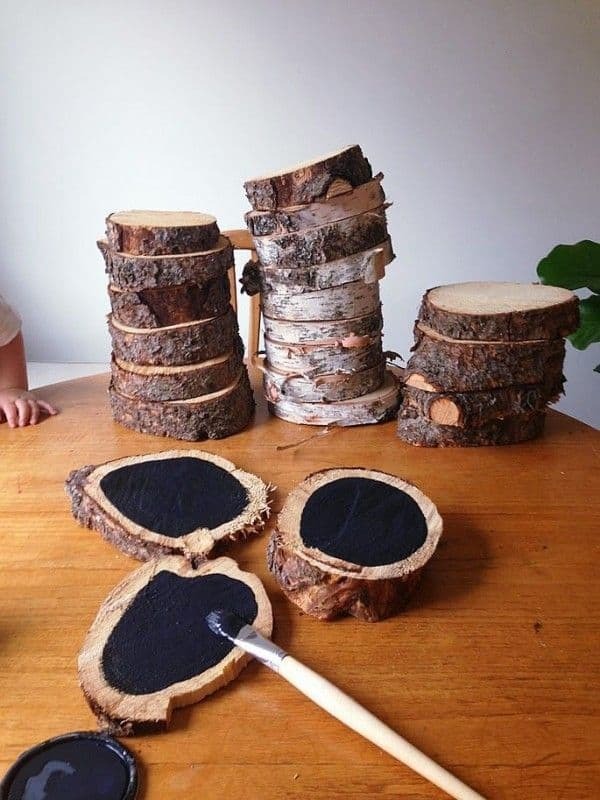 Craftaholics Annonymous suggests painting the wooden sections with some chalkboard paint and hanging them up on the wall! 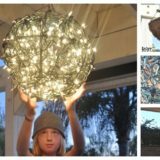 When you think of wooden crafts and DIY projects like these ones, does your mind always just automatically revert into upcycling mode and start thinking of ways that you can repurpose wood from other places rather than buy boards from the store? 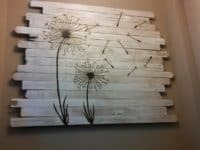 In that case, you’re going to love the way Pretty Designs gave a whole piece of a wooden fence a new lease on life for this pretty wall hanging! 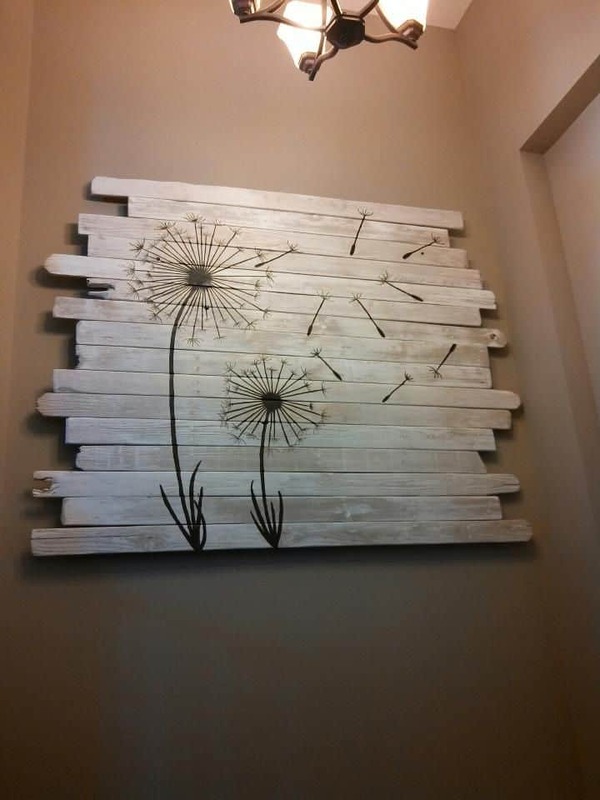 We think their hand painted dandelion design is adorable and simple to recreate, but you could also just take their basic idea as inspiration and paint your own image on a section of wooden fence posts to suit the décor scheme you already have. Are you very into the idea of painting wood but you’re not actually all that attached to the requirement that it must be done by hand? 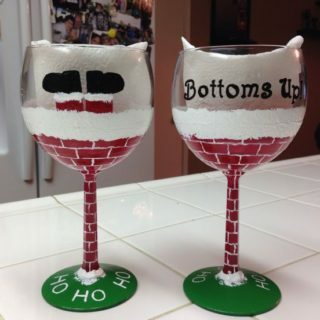 In that case, you might prefer to work a little more quickly by using spray paint! We love the neat, effective way that Hative chose to create their V-shaped pattern using duct tape and some spray paint (which could be any colour you choose). Are you the kind of detailed décor enthusiast who loves it when everything matches and suits the scheme you’ve already got going? 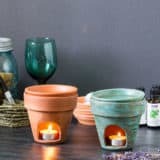 Then you’re probably just the kind of person who would appreciate the look of purposely weathered bowls, just like these ones from Clean and Scentsible! 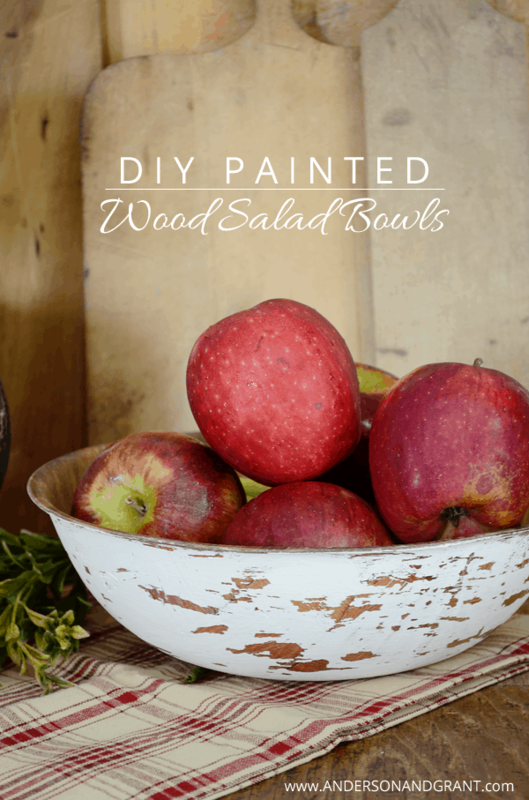 Their technique involves painting the bowls and then chipping the paint as though they’ve been used for years and washed many times. 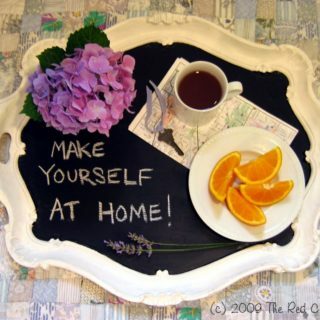 Just in case you don’t quite have enough ideas yet for ways to make your home look wonderfully lived in and lovingly weathered even if it’s brand new, here’s another one for you! 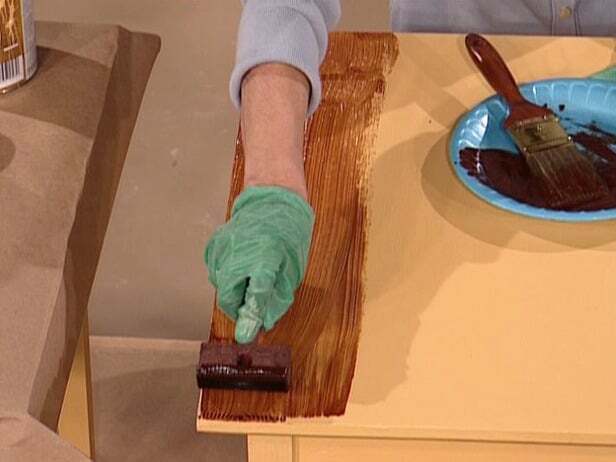 DIY Network guides you through the steps for creating a faux wood grain on a surface that has actually been sanded smooth and, once it’s finished, dried, and fully completed, we think you’ll agree that it looks surprisingly authentic for such an easy technique! 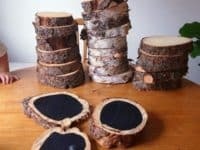 Were you intrigued by our earlier discussion of cut wood pieces but you’re not sure that those tutorials and projects are quite for you because the slices you have access to are actually much smaller than what those worked with? 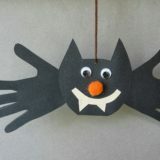 Then perhaps you’d prefer this smaller project from Unoriginal Dime instead! 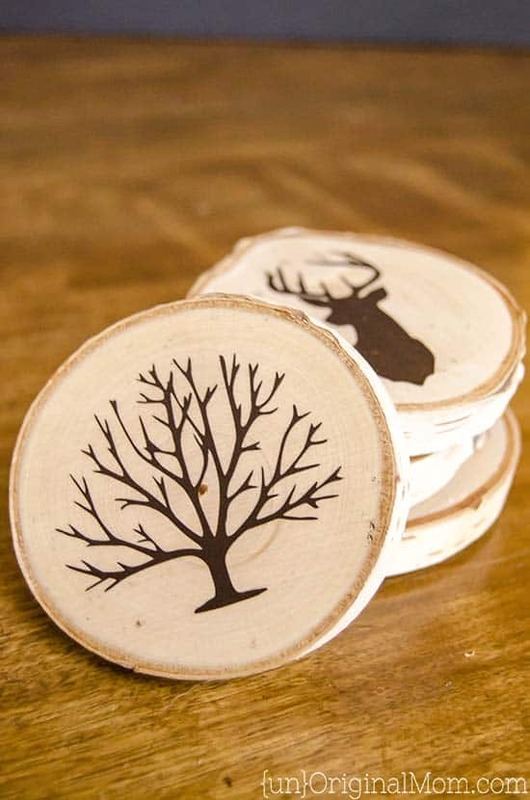 They show you how to turn thin, circular cuts of wood into decorative drink coasters just by adding an image, design, pattern, or quote using your painting skills. 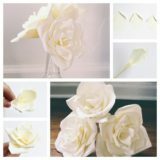 We’ve talked about adding a wood grain to something that doesn’t already have it, but what if the wooden piece you’d like to work with does have it already and you’d actually just like to emphasize that in a creative way! 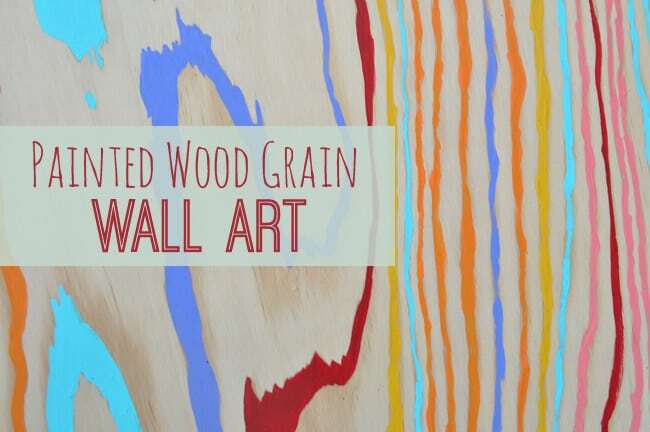 In that case, we think this super fun wall art idea from Chica Circle is perfect for you1 They suggest tracing the lines in the grain with your paint brush and different colours of bright paint to create a wavering rainbow effect all across the board. 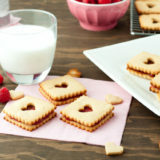 Perhaps you’re the kind of DIY enthusiast who is really ready for a challenge? 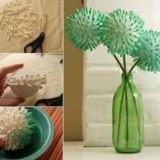 In that case, you might be more interested in something that’s more of a decorative undertaking! 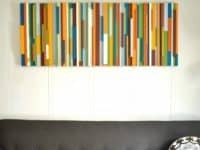 We love the way Correctly Design created themselves a reclaimed wooden slat accent wall behind the headboard in their master bedroom but, even more than that, we love their idea of painting a few of those boards a bright colour in order to make an additional contrasted detail within the accent. 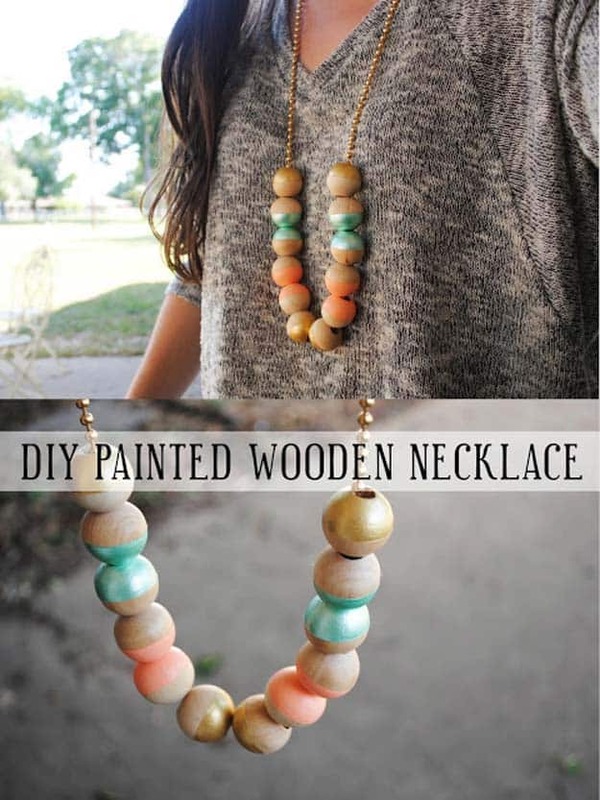 Sometimes some of the prettiest wooden jewelry you’ll come across, particularly in the world of DIY and crafting, is the simplest design! 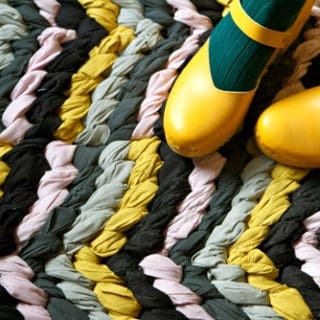 That doesn’t mean, however, that there aren’t ways to jazz a simple design up to suit your personal style. 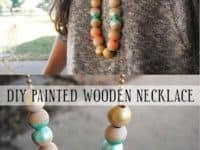 This wooden bead necklace by Swallows Heart is a perfect example of what we mean. 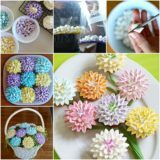 They’ll show you how to add some colour to each bead by paint dipping one half of each before stringing it.